Most wrist watch enthusiasts are also much caring about the structure and the disposal of the movements, besides the design of the look. 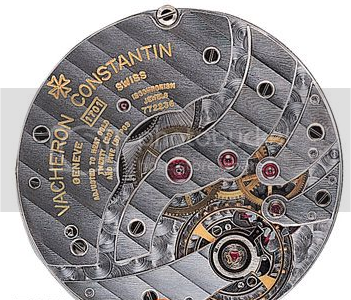 In this passage, we are going to introduce 18 main movements of Vacheron Constantin, most people may have understood the beauty of mechanical movements, but the minority quartz movements that will introduce in this passage show a special sense of beauty, though their structures are simple. 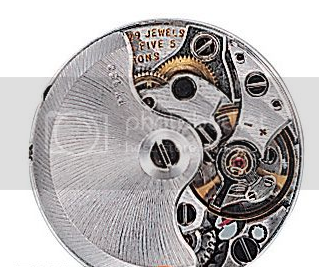 It's truly a famous factory, the quartz movements it produced have Geneva Stripes, Perlage and chamfering, etc., people who thought all the quartz movements are coarse and inexpensive should change their mind. 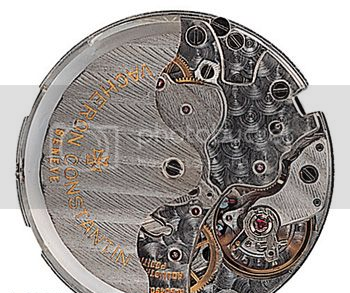 It derived from the ultra-small movement, the Cal.1055, it has the maximum winding function among the small size movements, its auto rotor was made from the platinum PT950. Its diameter is 15.70mm, the thickness is 3.90mm, it has 21 jewels, beats 21,600 /h and has 44 hours power reserve. This movement was first equipped in the limited edition Ref.47240 to commemorate the 240th anniversary of Vacheron Constantin in 1995. It based on the Cal.1126, plus the power reserve indicator. Its diameter is 26.60mm, the thickness is 4.85mm, it has 45 jewels, beats 28,800/h and has 48 hours power reserve. This movement mostly used in the elaborate women's watches, it's very convenient for the thin body and the easy and durable structure. Its diameter is 6.8mm, the thickness is 1.6mm, and it has 7 jewels. 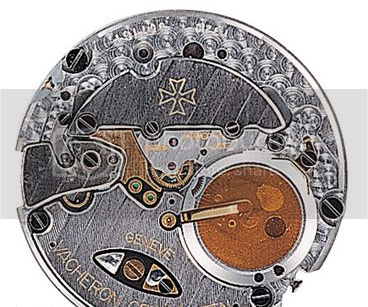 It was launched in 1990, also the smallest circle movement in the modern movements of Vacheron Constantin, though its diameter is very small, it's highly appreciated for its high accuracy and sufficient power reserve. Its diameter is 15.70mm, the thickness is 2.10mm, it has 21 jewels, beats 21,600/h and has 44 hours power reserve. It was the fifth generation of the Overseas series automatic movement in 1996, it had strengthened the power reserve function and had a higher accurate rotor. 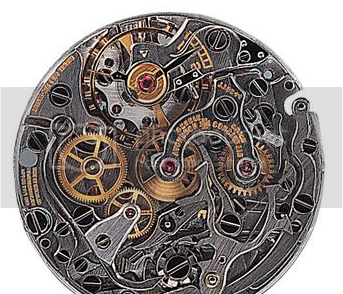 In 1999, it derived the modified movement in the same type, the Cal.1312, because of its increased function. Its diameter is 26.60mm, the thickness is 3.25mm, it has 36 jewels, beats 28,800/h and has 40 hours power reserve. 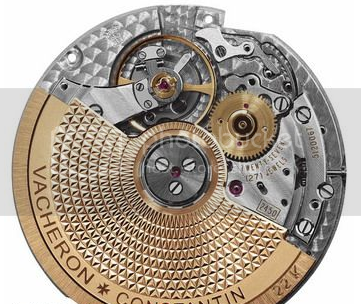 Since the earliest specialized manual winding movement, the Cal.453 was launched in 1930, and was changed the model number in 1950, the Cal.1001 had become the modern major manual winding movement of the Vacheron Constantin. This is the newest movement of the Cal.1001. Its diameter is 21.10mm, the thickness is 2.94mm, it has 21 jewels, beats 21,600/h and has 41hours power reserve. 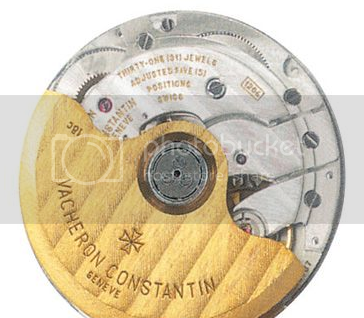 This is the main manual winding movement of Vacheron Constantin, the excellent design made this movement has a high usage rate, and it has many modified version, such as the Cal.1701 QP with perpetual calendar and chronograph function, and the Cal.1701SQ skeleton version with excellent quality. Its diameter is 36.1mm, the thickness is 1.9mm, it has 20 jewels, beats 21,600/h, has 40 hour power reserve. 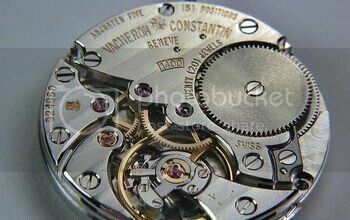 It's an oblong manual winding movement launched in 1996, it was modeled the Cal.1014/2 which was based on the Cal.  1001. Its diameter is 17,20mm times 22.60mm, the thickness is 2.94mm, it has 18 jewels, beats 21,600/h, has 40 hours power reserve. It's one of the flagship movement of Vacheron Constantin, it was garishly equipped perpetual calendar, stop watch and moon phase functions, plus the automatic winding system that perfected these top-class functions. It has 28mm diameter and 7.1mm thickness, has 38 jewels, beats 21,600/h and has 40 hours power reserve. 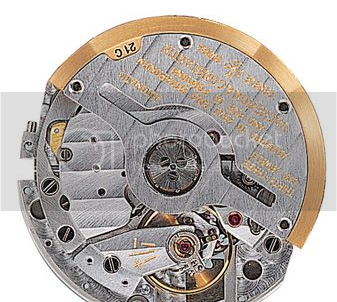 Since the earliest automatic movement the Cal.477 was launched in 1950, it had been modified to Cal.1019 and Cal.1071, finally it launched the fourth generation of the newest main automatic movement. It's much thinner and more elegant than the Cal.1071. It has 26.60mm diameter and 3.25mm thickness, has 36 jewels, beats 28,800/h and has 40 hours power reserve. 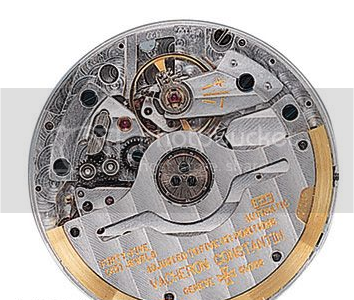 This is a manual winding chronograph movement of Cal.492 that was made in 1960. 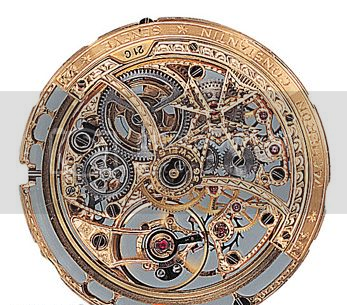 It possessed a balance wheel that can adjust the screws, a Breguet spring and a swan neck fine adjustment, those symbolized the vintage watch making craftsmanship. Its diameter is 27.50mm, thickness is 5.57mm, it has 21 jewels, beats 18,000/h, has 44 hour power reserve. 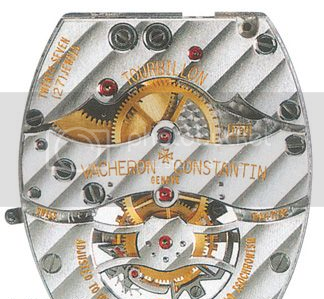 The newest tourbillon movement launched in 2000, it was the first tonneau-shaped complicate movement, and the entire tourbillon escapement board was equipped a Malta Cross board, it shown a unique type of Vacheron Constantin. Its diameter is 27.37mm, thickness is 6.1mm, it has 27 jewels, beats 18,000/h and approximately 55 hours of power reserve. 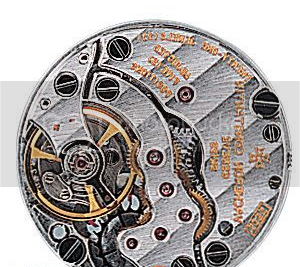 It was launched in 1999, is the newest complicate movement of Cal.1126 series, has the retrograde date function and pointer day function, etc., it's the newest modified movement. Its diameter is 26.60mm, thickness is 3.25mm, it has 36 jewels, beats 28,800/h and has approximately 44 hours of power reserve. 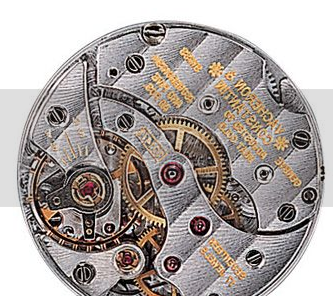 Vacheron Constantin launched the Cal.1003 in 1955 for commemorating the 200th anniversary of the establishment. It used suspended barrel, used an old balance that can adjust the screws, all this parts symbolized the time. Its diameter is 21.10mm, thickness is 1.64mm, it has 18 jewels, beats 18,000/h and has approximately 31 hours of power reserve. 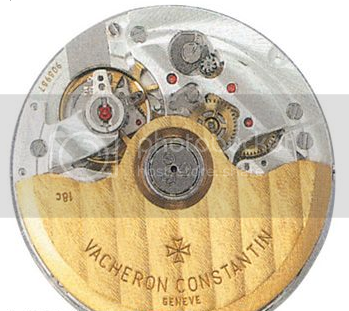 Vacheron Constantin rarely used quartz movements in mens watches, but once it launched, the quartz movements must be the amazingly top-class that was engraved with Geneva Stripes and used jewel bearing, etc.. Its diameter is 23.9mm, thickness is 2.7mm, it has 8 jewels. 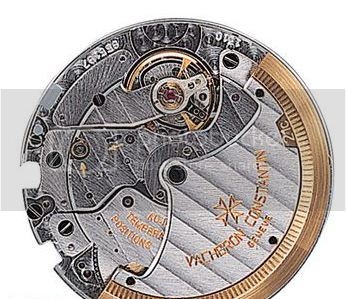 Recently, the main automatic movement of Vacheron Constantin was equipped in the Malta Large Calendar, equipped the 18K gold auto rotor and engraved Geneva Stripes, also had the COSC certification. The diameter is 26.2mm, the thickness is 4.47mm, it has 29 jewels, beats 28,800/h and has 60 hours power reserve. The Cal.1206 that was launched in 2000, needs fewer mechanical power of the gear, so, it can reduce the mechanical friction, and maintain the permanent accuracy of the movement. It also equipped a second time zone indicator that made it more special. The diameter of this movement is 26.2mm, thickness is 4.92mm, it has 31 jewels, beats 28,800/h and has 40 hours power reserve. 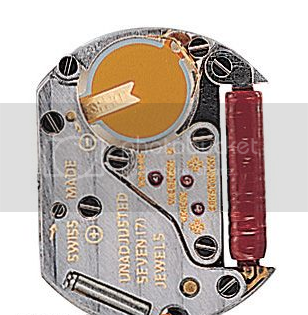 An in-house movement launched in 2001, it owned the high technology of the Geneva Seal. The diameter is 20.29mm, thickness 2.60mm, it has 20 jewels, beats 28,800/h and has 40 hours power reserve. VC 452 (sub seconds) based on JLC 452. VC 453 (sub seconds) and 454 (center seconds) based on JLC 449. VC's first automatic caliber 477 based on JLC bumper-winding caliber 476. VC's first rotor winding caliber 498 (center seconds) and 499 (sub seconds) based on JLC 493 and exclusive to VC and Audemars Piguet. Developed into VC caliber 1019. VC 1001 (sub seconds) based on JLC 818. VC 1002 (center seconds) based on JLC 819. Both exclusively for VC and Audemars Piguet. VC extra-flat caliber 1003 based on JLC 803, exclusively for VC and Audemars Piguet. VC improved automatic caliber 1070 (sub seconds) still based on JLC 493. 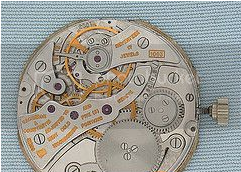 Developed into VC caliber 1071 (center seconds) and 1072 (date) and 1072/1 (Gyromax balance). 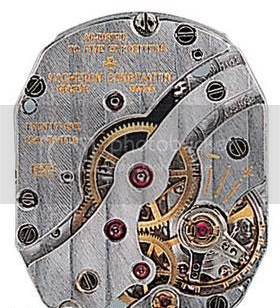 VC extra-flat automatic caliber 1120 with Gyromax balance based on JLC 920 ebauche, exclusively for VC, AP and Patek. This was followed by VC 1121 with date. VC Chronometre Royal automatic caliber 1096 based on JLC 906. VC Chronometre Royal manual caliber 1007/BS (sub seconds) and 1008/BS (center seconds) based on JLC 478/BWS. VC chronometer caliber 1310 and 1311 based on Girard-Perregaux 3100. VC 1145 based on Lemania 1872. VC 2-register chronograph caliber 1140 based on the Lemania 2320. VC 1141 based on Lemania 2310. VC's vintage 2-register chronograph caliber 434 based on Valjoux caliber 22. VC caliber 492 based on Valjoux 23. VC rectangular caliber 1017 based on JLC 822. VC 3-register automatic chronograph caliber 1137 based on the Frederic Piguet 11.85. VC 1206 based on F. Piguet automatic caliber 11.50. VC 1132 based on F. Piguet manual caliber 8.10.